Those of us who are inclined towards music making are of course aware that the iPad (and to a degree other iOS devices) has started to be viewed as a serious music-making device in the past year. We’ve been inundated with music apps for the device from straightforward digital audio workstations and sequencers such as Garageband and Nanostudio, to synths like Sunrizer and also innovative ones such as SoundPrism and Gliss. This year however, at NAMM – the twice yearly leading music technology event that takes place in Anaheim, California – its hardware that’s driving the iOS music making revolution forward. 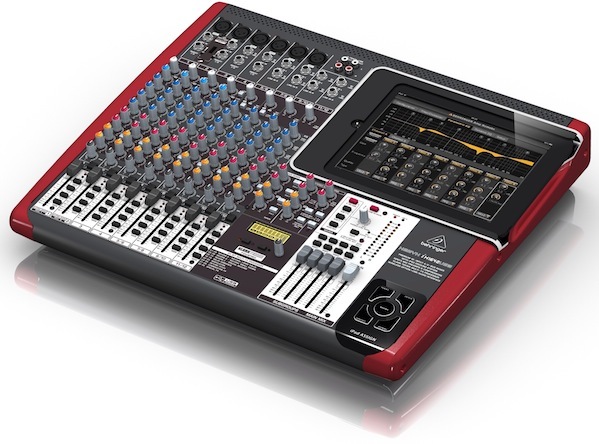 I have to admit, I had to suppress a laugh when I first saw an image of one of these, not because they don’t look great – because they do – but just because I thought the idea of a mixing desk that an iPad docks into is too audacious a concept to be real. Turns out I was wrong because this mixer, which comes with either 16, 24, and 32-input channels will be available this year. Each model will include a USB audio interface, XENYX mic pre-amps, 3-ban channel EQ, one-knob compression on every mono channel and 32 customizable presets including reverb, chorus, and multi-effects powered by the KLARK-TEKNIK FX processor. Behringer has a reputation as the creator of cheap equipment for amateur musicians and producers and therefore I expect the price of these mixers to be at the right point for people who have invested in an iPad and are looking for the right tool to use for recording music. I also think that these mixers, which can of course also be used with your home studio setup could be great for transferring basic tracks made on the iPad to a desktop based DAW or sequencer. 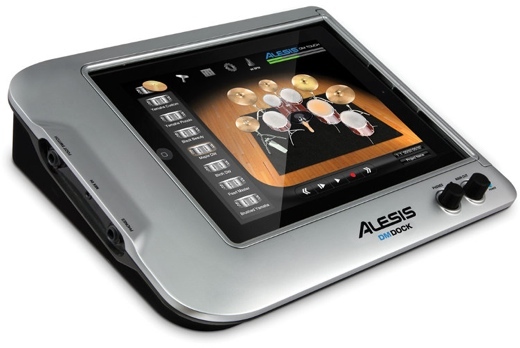 While guitarists, vocalist and keyboard player have been slightly spoilt by some of the software and hardware that’s become available for iOS devices, drummers have been a little neglected so far and so its good to see Alesis setting this straight with a dedicated dock for the iPad owning drummer in your life – the DM Dock. The dock features 13 individual 1/4-inch TRS trigger inputs for connecting drum and cymbal pads and other trigger as well as Traditional MIDI and USB MIDI connections, and an assignable footswitch input are also onboard so you can toggle between kits, tap in a click tempo, or start and stop sequences. Alesis is also bringing out the Alesis Module Mount which allows it to be mounted to any stand or rack. I expect that, in addition to some of the apps out there already, if this takes off then we’ll see some high quality drum apps coming to the iPad, hopefully even versions of successful plugins like Addictive Drums or EZ Drummer. Following in the footsteps of their Synthstation keyboards for the iOS market, Akai has announced an iPad orientated version of their highly regarded MPC controllers that comes in a laptop style case. 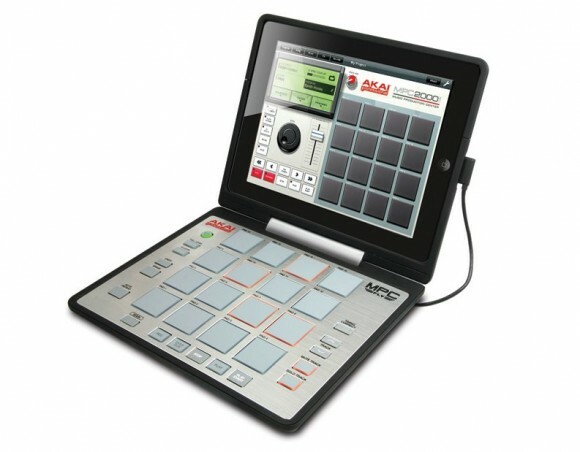 The MPC Fly, which is designed for the iPad 2 (and presumably future models) has many of the features that make the MPC range great such as velocity sensitive pads, note repeat and MPC swing. Akai is also releasing an iPad app for the MPC Fly which will allow you to sequence four tracks simultaneously, sample from your iPad’s line-in or mic, and share your creations on SoundCloud, Facebook and Twitter. I really like the look of this, but be warned if you do too, as Akai does have a history of taking a while to actually get its iOS hardware to the shops, even though it is certainly worth the wait when it arrives. If you’ve ever played the electric guitar, then you’ll know that there is nothing quite like stomping on a stompbox and letting rip with some distortion or FX. So, IK Multimedia, which has led the charge into iOS music hardware with its other iRig products, is now looking to make your day. Designed to work with their popular Amplitube iOS app the iRig stomp allows you to incorporate your iPad into your signal chain (and this mix it with your other FX pedals) and output to your amplifier or PA system and since its durable and light should fit right in with any iPad owning axemasters existing live setup. 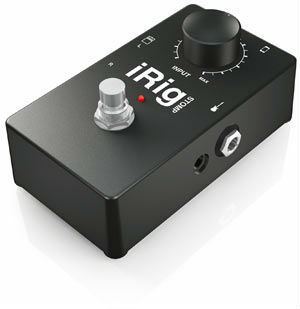 Whereas IK Multimedia’s original iRig felt more akin to a tool to practising at home this looks like something you’d certainly want to use live especially since, using Amplitube it could allow you to unleash a great range of FX from your iPad with a single stomp.